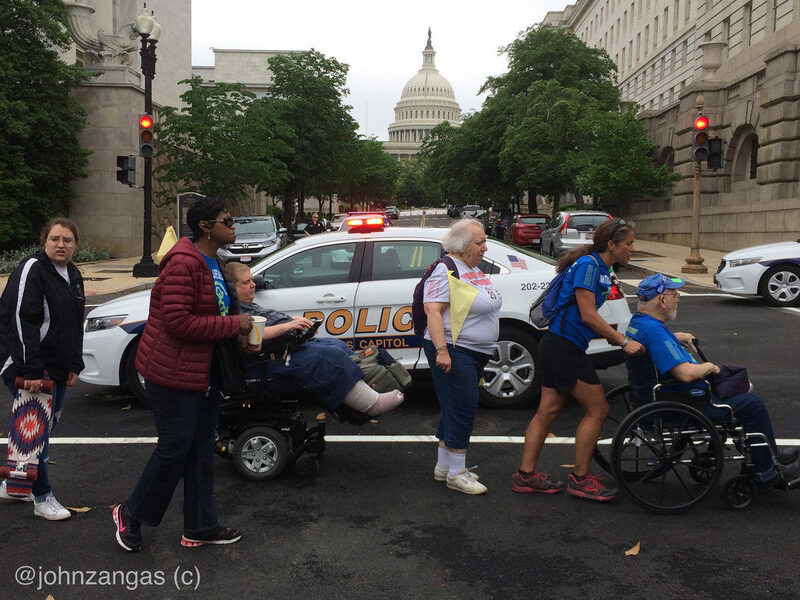 Washington, DC–Disability rights organization ADAPT held its 13th annual Fun Run in Spirit of Justice Park near the U.S. Capitol on Mother’s Day. Several hundred people took part in the event, which kicked off its Week of Action in Washington. Nearly $3,000 was raised to support ADAPT programs. Fun Run participants, who had solicited sponsors, walked or rolled laps around the paved border of the park. On the way to the starting point for the run, they formed a long procession of wheelchairs from Federal Plaza along Congressional office buildings. “Our homes, not nursing homes!” they chanted, and “Down with nursing homes, up with attendant care!” as they made their way to the park. ADAPT is making the case that allowing the disabled in their homes and communities makes more sense than placing them in nursing homes. It not only saves money, it permits them to continue living more fruitful and productive lives. Tony Brooks of the Philadelphia chapter of ADAPT said that he was able to remain in his community because of attendant care. “I lived in a nursing home, and I did not like it, so I had to move out. But getting to move out was a struggle because there was a political side,” said Brooks. “Any person with a physical disability, the first option is going to a nursing institution, which is not right. We can live in the community independently with a PC, which is much cheaper,” he said. The Fun Run was also a moment to reflect on two women champions of the disability rights community who had recently passed away. Barbara Toomer, 88, was ADAPT’s most senior warrior. Arrested more than 35 times, she was instrumental in getting lifts placed on buses and getting businesses and restaurants into compliance with the Americans With Disabilities Act. Another honoree was Babs Johnson, who created the ADAPT flag. It resembles an American flag with stars arranged in the shape of a person in a wheelchair, the National ADAPT logo. She was credited with being a foundational organizer for ADAPT as well as a feminist who had few words but instead let her actions speak for her. She also worked on the bus life initiative and provided extensive logistical support to ADAPT activists. ADAPT is presently working to pass the Disability Integration Act, civil rights legislation intended to protect those forced to live in institutions due to their need for long-term service and support.